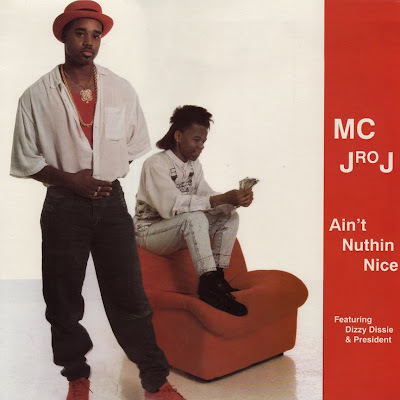 MC J Ro J "Ain't Nuthin Nice"
One more piece in the J Roget puzzle. This 12 doesn't capture the same timeless New Orleans vibe as the "Let's Jump" single, but its still a varied and interesting document. There seems to be a correlation between the music on his records and the oufit he wears on the front but I've haven't quite figured what it is. How similar is the production on Mia X's "Mommie Dearest"? Does it sound more like this or the Westbank tracks we're familiar with? Please yall, if anyone's holding that one don't hold out. Funny dated samples and references: "Sometimes, I feel like a nut", "Homie don't play that", Snap! 's "I've Got the Power". KLC is a sleepy-eyed B-Boy turned producer. He comes with the "Michael Meyer" beats, that are eerie and wicked. He's also the one who usually produces the rowdy Soldier songs. They say that, to get him to produce a hit beat, the keyword is, "food". He can produce well on a full stomach than on an empty one. Also, the beat to the rowdy anthem, "Bout It, Bout It" was an accident gone right. After KLC's one year old daughter Crashan, started messing with his equipment, he realized the beat she added was what he was looking for. He also raps, which he made his debut act on Mia X's, "Mama's Family" off, Unladylike. Congrats on making Vibes list. I love your blog, you have some good, hard to find stuff. Keep up the good work...thanks! Nice, I had never been able to track this one down. Thanks. Also, congrats on the Vibe mention. It's well earned. Can you reupload MC J-Ro please and thank you!